This event will be held at the Vale Douzaine Room between 10am - 12 noon in aid of Cancer Research Please click here for more information. BTS will donate five pounds from every purchase from the products featured on the attached poster to The Pink Ladies. Campaign will run while stocks last until 12/11/11. http://www.btsgsy.com Please click here for more information. ** Due to unforeseen circumstances, this event has been cancelled ** Please click here for more information. Thank you to all walkers and volunteers who made yesterday's Sunset Walk another amazing success, despite the appalling weather conditions. Your support means so much to us so THANK YOU ! Please click here for more information. Mr Rainsbury is giving a talk at the Rocquettes Hotel between 7.30 and 8.30 this Thursday 27th October. Please click here for more information. The Macmillan HOPE Course is for people who have survived cancer and is due to start next week on Tuesday 25 October at La Trelade. The first week is a taster session and is followed by a six week course. We need at least 8 interested people to start the training. The course is free and three of the trained tutors have all had cancer. If you are interested in joining the course, please see the attached poster for more details. Please click here for more information. Passion for fashion made a lot of money for the Pink Ladies on Saturday night and Gemma Hockey was there. There are some great pictures by Adrian Miller - check them all out here. Please click here for more information. The Pink Ladies are holding a quiz night at the Peninsula Hotel on 18th November at 7.30pm. Please click here for more information. Courts fashion show boosts the Pink Ladies. ISLANDERS will be seeing pink at a fashion show to raise money for a cancer support group. Funds from Saturday's annual fashion show at the Royal Court House will go to the Pink Ladies. Please click here for more information. Marie-France Walden from SenseAbility Beauty Salon is holding a Christmas shopping event on Monday 17th October from 6pm held at Les Rocquettes Hotel 1st floor. Please click here for more information. In December 2010 the Town Church will again be hosting a Christmas Tree Festival and the Pink Ladies will once again be participating. This will be the fourth year that the Festival has been staged and it is becoming established as a showcase for local charities to raise awareness of their work in the island, and also to raise funds for their on-going work. The Festival will run from Thursday 9th December to Sunday 19th December inclusive. Please click here for more information. We are delighted to be participating in the 2nd Town Church Christmas Tree Festival. Please click here for more information. 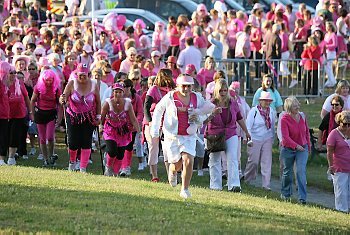 Chef Tony Leck will be walking several times around Alderney on Saturday to raise money for the Pink Ladies. Please click here for more information. Memory of her mother spurred Tui to finish line. THE last three miles of the London Marathon were the hardest, according to one participant. Tui Winstanley, 43, ran in aid of the Pink Ladies after losing her mother to breast cancer. She completed the 26.2-mile course in five hours two minutes. Please click here for more information. Girls Night In is being held on Wednesday the 19th of October from 7.30pm at Curves who have 100 tickets to sell to members and non-members for 5 pounds. Please click here for more information. On SATURDAY 1ST OCTOBER the Pink Ladies are organising a fun Zumba® Fitness workout to help raise awareness about breast cancer prevention. The event will take place from 11am-12pm at St. Sampson's High School. Please click on the link below for further information. Please click here for more information. On Sunday 13th April 2008 the 28th Flora London Marathon took place, with over 35,000 people taking part. This year Tui (Sommart) Winstanley joined them, running the 26.2 miles in aid of the Pink Ladies. Please click here for more information. LADIES choir Bel Canto will be in the pink for charity when it stages its first concert on Saturday. Raising money for the Pink Ladies breast cancer support group, An Audience with Bel Canto will feature a range of songs by the Eisteddfodwinning choir, as well as guest appearances from a number of local musicians. Please click here for more information. At the Pink Ladies flag day on Saturday more than 70 people, including group members, family and friends, volunteered to help. Please click here for more information. An open presentation will be held at St Pierre Park Hotel on the Thursday 7th Oct 2010. Please click here for more information. Dr Paul Townsend PhD, Reader in Human Genetics, Department of Cancer Sciences, University of Southampton will give a presentation on "The Guernsey Breast Cancer Research Project". Please click here for more information. The Pink Ladies will be the beneficiary of Tui Winstanley’s marathon run. The assistant manager of financial control at HSBC Private Bank chose the charity after losing her mother to breast cancer at 40 when she was only 10 years old. ‘I feel it is now time for me to help others and I hope to raise as much as I can to help the Pink Ladies.’ Please click here for more information. The event will take place on SUNDAY 18TH SEPTEMBER at 1pm at Vazon Bay car park. Click on the link below for further details and sponsorship form. Please click here for more information. Due to unforeseen circumstances this event has been cancelled. If you have bought tickets please contact Laura de Putron on 07781 420566 or email Laura@deputron.com Please click here for more information. The Old Elizabethan Association is holding a Lecture Lunch at the 'Farmhouse' on the 1st of November, at which the speaker will be Professor Gordon McVie MD, FRCP, FRCS Ed, FMedSci, DSc(Hon), a leading international authority on the research and treatment of cancer. Please click here for more information. Local breast cancer support group The Pink Ladies will be the charity to benefit from this year’s Miss Guernsey event. The black tie gala night takes place on Friday 22 October 2010 at the Farmhouse Hotel with a special pink carpet forming the focal point for both competitors and the audience. Please click here for more information. Welsh Boys Aloud are singing at the Fermain Tavern to raise money for the Pink Ladies. The Pink Ladies would be most grateful if you would consider supporting this event Please click here for more information. Diane and Kirk Shaw are taking part in a sponsored hike in Peru along the Inca Trail from 1 to 5 October 2008 Please click here for more information. I will be raising money for the Pink Ladies when I travel to Chamonix in September 2011, to attempt to reach the summit of Mont Blanc, Western Europes highest mountain at 4810m (15,782ft). I am trying to raise money for the Pink Ladies. Both as a thank you, for all the support they have given to my immediate family and as a way of helping the Pink Ladies provide the on-going ability to give someone else their support and friendship when they need it most. Please click here for more information. Welsh Boys Aloud Choir at the Eisteddfod. The Welsh Boys Aloud Choir are singing on the evening of February 27th in the Eisteddfod and would welcome any Pink Ladies or supporters to go along and support them and meet the gang. Please click here for more information. MORE than 200 people attended Friday night’s charity concert, From the Darkness to the Light. The event helped to raise thousands of pounds for the Pink Ladies and Les Bourgs Hospice. TV personality and songwriter Beechy Colclough headlined the evening at the Princess Royal Centre for the Performing Arts. Please click here for more information. On Saturday 11th October 2008 the Bel Canto Choir will be performing at the St. James Concert Hall in aid of the Pink Ladies Breast Cancer Support Group. Please click here for more information. The Pink Ladies are delighted that the band Moojoose will be playing at the VENTURE INN on SATURDAY, 7TH JULY at 9.00pm, and the proceeds of the gig are being donated by the band to the Pink Ladies. Please click here for more information. Maureen Gillanders is having an open day on Saturday 14th November 2009 from 10am-4pm in aid of the Pink Ladies. Please click here for more information. 'In the Pink'. Local band Tresamis in association with the Pink Ladies present an evening of live jazz music on 16th September, spanning the decades from the Sinatra classics through to the latest contemporary artists the likes of Pink Martini, Madeleine Peyroux and Caro Emerald. Come and dance the night away or simply sit with a glass of wine and let the music take you! Please click here for more information. MOTORISTS will get the chance to sprint in their road cars for next month. The ‘open to all’ event on 23 October will raise money for breast cancer charity the Pink Ladies. Please click here for more information. We are not planning a walk this year but will soon be starting to organise one for next year, which will hopefully be in June. An announcement will be made in the Guernsey Press when details have been completed. Please click here for more information. Please join CARERS COMING TOGETHER for a Wheelchair Walk on Tuesday 14th June. Please click here for more information. Beechy Colclough in conjunction with Dave Fuller are bringing over an 8 piece band to play 2 gigs at the Princess Royal Performance Centre on the 23rd & 24th October. Please click here for more information. GEP Article By Gemma Hockey 17th September 2007 MORE than £100,000 was raised from the first Pink Ladies' Sunset Coastal Walk. Please click here for more information. - 06/09/2008 Please click here for more information. Galaad Methodist Church are having a "Pantry Sale" on Saturday 6th October at Galaad Church from 10am till 12pm and all the money raise will be donated to Pink Ladies. Please click here for more information. Carol Vivyan is going to kayak around Guernsey in June as part of the Crimestoppers Round Island Kayak Challenge. The distance over the ground is about 30 miles, and we're aiming to do it in 9 hours, on either 5 or 19 June 2011 to raise money for the Pink Ladies as I have a strong family history of breast cancer. Please click here for more information. - 31/07/2010 Please click here for more information. 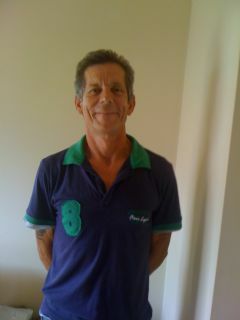 My name is Dave Rosamund, I am 52 years of age, have 3 boys and two beautiful grand daughters. I have always enjoyed running and since my recent seperation from my wife this has become my passion a close second to my family. I have this year therefore decided to put my passion to good use and run a few marathons, 3 to be percise. In total I will strangely enough be running 52 miles, one for each year of my life. The children think I'm mad but they know I enjoy it so much they will be there cheering me all the way. Please click here for more information. Patrick Holford is one of Britains best-selling nutrition writers, frequently appearing on national television and in the press. During the last decade he has written over thirty books including The Optimum Nutrition Bible, The Holford Low GL Diet and Optimum Nutrition for the Mind. His books are available in 30 countries and are in 15 different languages.100% Health Members get special prices. Please click here for more information. PINK DAY - Friday 27th October 2006 Please click here for more information. Les Blondettes will be performing at The Venture in on Saturday 9th July 2011. Les Blondettes said “We decided to raise money for the Pink Ladies as it’s the Race for Life the next day we thought (as an ‘all girl’ band) it was fitting to do something for our local Pink Ladies. We have all been touched by and known someone who has been affected by breast cancer and just wanted to do our bit. We hope to be wearing pink outfits too!” Entry is free with a bucket collection. The evening will start about 8.30pm with Les Blondettes on about 9.30pm for the first set. Les Blondettes Public events: May 9th – Liberation Day Tea Dance tent – 4pm May 28th – Captains, St Martins - 9pm Please click here for more information. Dave Rosamund has organised a Charity Horse Racing Night to raise money for The Pink Ladies and Help a Guernsey Child. Please click here for more information. Elizabeth Jordan who is an events organiser, has organised for June Kenton, the founder of Rigby & Peller, to come to Guernsey for a champagne reception at 7pm at Sausmarez Manor on Thursday 2nd November with profits to the Pink Ladies. Rigby & Peller, famous for the quality of their bespoke lingerie and the innovation of their styling, have held the Royal Warrant of Appointment as Corsetieres to H.M. Queen Elizabeth since 1960. Rigby & Peller are well known for the quality of their luxurious lingerie, expert bra fitting service, and their extensive ranges of beautiful ready to wear merchandise sourced from all over the world to ensure that they offer the most comprehensive lingerie range possible. Please click here for more information. Local band City Limits are teaming up with the full Orchestras of Highly Strung and Hornifed, made up of many local musicians, joined by a few travelling from London, to perform a charity fund raiser gig in aid of Mind and the Pink Ladies, which coincides with City Limits' 21st Birthday. Please click here for more information. Race for Life is Cancer Research UK's flagship event, with over 230 events taking place across the UK. Read our story so far and find out how women coming together across the UK to walk, jog or run 5k is helping to beat cancer. Please click here for more information. The organisers of The Girls Night In on 30th November 2006 wish to thank everyone who helped to make this such a successful night. Please click here for more information. The Pink Ladies are proud to be entering a team in the 30th Swimarathon, on Sunday 8th October at 5.00pm and are delighted to have the infamous channel swimmer Roger Allsopp joining the team! Please click here for more information. The Pink Ladies are pleased to announce that this year's Sunset Coastal Walk will take place on Saturday 20th June 2009. Further details were launched in the Guernsey Press on 21st April. Please click here for more information. Jayne Wallbridge, a member of the Pink Ladies and 5 other brave colleagues and friends, Christine Dorey, Liz Dorsch, Emma Duff, Jo White & Jackie Yeates will be taking part in the 2011 Moonwalk on 14th May 2011. Please click here for further information and a link to their fundraising page. Please click here for more information. CMA very kindly gave the Pink Ladies a stall at this event to sell produce to raise money for our Charity. Please click here for more information. THE Guernsey Press can announce today that the Pink Ladies’ Sunset Coastal Walk is back again this year. Please click here for more information. Confused by colour? Want a makeover? Please click here for more information. SALSA BALL IS TO BE HELD AT THE VICTOR HUGO, ST PIERRE PARK HOTEL Featuring Fantastic Professional UK Dancers Nicolai Vigneswaren & Andrea Stewart + visiting Salseros. Please click here for more information. Officepoint at Barras Lane have an original painting on sale to the highest bidder. The proceeds will be donated to the Pink Ladies. Please click here for more information. A concert of beautiful words and music to remember your departed loved ones. Please click here for more information. On Sunday 1st March 2009 from 11am – 6pm at Beau Sejour Leisure Centre you will have the opportunity to meet with many local wedding suppliers under one roof - An essential visit for anyone planning a wedding. An added bonus is that 50% of entrance fees will be donated to the Pink Ladies! Please click here for more information. Saumarez Park once again played host to a number of top UK musical acts in order to raise money for Wave's chosen charity, the Pink Ladies on Sunday 16th July. Please click here for more information. Drop-in clinics to advise islands with severe illnesses about what benefits are available to them are being run by the HSSD and the Social Security Department. Please click here for more information.